Remember all that leftover turkey we were talking about in our last post? Well, here is another way to use up some of it. We’re eating a savory bread pudding using leftover bread, leftover shredded turkey, truffle oil, slow-roasted tomatoes and double Gloucester cheese. While the bread pudding may look like stuffing… and may taste a bit like stuffing… it totally hits the spot! This is the perfect dish to throw together using the remains of a holiday meal – especially if you didn’t eat much stuffing at the meal… Sh*t, even if you did eat a bunch of stuffing! Who said there was such a thing as too much stuffing… er, bread pudding?!? *Note: If you only have fresh bread, dry the bread out in a 300 degree oven for about 1 hour, tossing occasionally. Do not toast or brown the bread. Preheat oven to 350 degrees. Place rack in upper-third of oven. Lightly grease a deep glass or ceramic loaf pan. To a large mixing bowl add 2 eggs and two cups of whole milk. Whisk to combine thoroughly. Add bread cubes to mixture stir and let sit for about 30-45minutes until the egg mixture has been almost completely absorbed by the bread. Toss occasionally. While the bread is soaking, place a saute pan over medium heat. Add canola oil to the pan. Once the pan and oil are hot add the chopped onion. Sweat the onion over medium heat, stirring occasionally for about 10 minutes until the onion is soft and translucent. Remove from heat. Place the loaf pan into a large deep rectangular baking dish. Pour hot water into the baking dish so that the water goes up to nearly half way the sides of the loaf pan, creating a water bath. The water bath will prevent the bread pudding from overcooking. Carefully place in the upper third of a preheated 350 degree oven. Bake at 350 for 45-60 minutes until top is golden brown and the bread pudding is cooked through. Let the bread pudding rest for 5-10 minutes before serving. Goes great with a drizzle of leftover gravy! Enjoy! After surfing your site and foodporn, I want you to be my personal chef. Too bad I’ll never be able to afford that! Your photos are amazing–so important to accompany the recipes. Great site, thanks! Great idea. 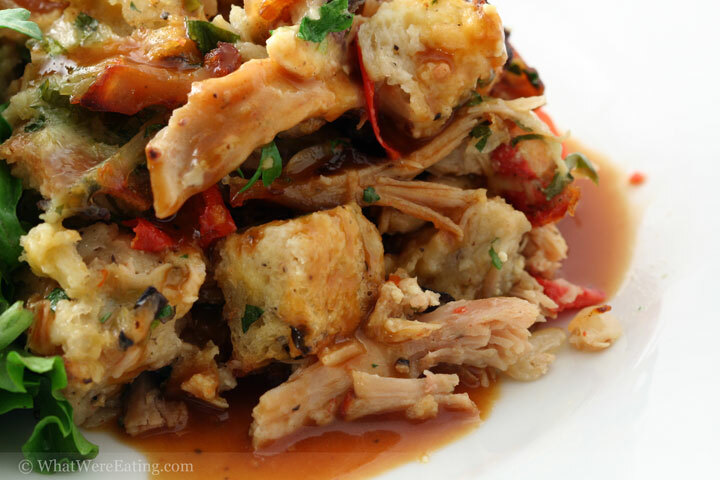 This is a great way to get my husband to eat chicken or turkey — anything mixed with BREAD.